Ecuador have won a lively game in Curitiba. Man of the match Enner Valencia put the ball in the net for his hat-trick in stoppage time but was ruled offside. Ecuador have a chance of making the last 16, but Honduras are all but out. Ecuador have taken off Caicedo and replaced him with a midfielder, Edison Mendez, as they try to close up ranks. Honduras are pushing for the equaliser. Exciting finish in store. Enner Valencia does it again, rising to head home a free-kick from his namesake Antonio. Ecuador are on top. Honduras bounced back almost immediately when they went behind in the first half, but a second equaliser might be a tall order. Honduras were lucky to get away with a risky challenge on Felipe Caicedo. The striker ran into the area and was brought down by Figueroa. There was enough contact for Caicedo to go down and claim a penalty but he stayed on his feet, the ball ran away from him and the chance was missed. A lively first half ends all square. Honduras almost took the lead just before the break, after Costly’s header rebounded off the crossbar and into the net off Jerry Bengtson’s chest, but the goal was ruled offside. And Ecuador have equalised almost immediately! Enner Valencia got on the end of a deflected shot from Juan Carlos Paredes and tapped in at the far post. Honduras take the lead after half an hour with a screamer from Carlo Costly. The striker got lucky with a long ball from the back, which Ecuador defender Jorge Guagua headed into Costly’s chest. The ball fell kindly for Costly, who smashed his shot past Dominguez. Route one stuff. We’re underway in Curitiba and Honduras defender Victor Bernardez has been booked after seven minutes, with the Hondurans carrying on where they off against France. Ecuador look the livelier side early on, with winger Jefferson Montero again their biggest threat. France were outrageously good for the first 80 minutes. Disregard the two late Swiss goals – the game was already won by then – this was a real statement of intent from Didier Deschamps’ side. Against a side renowned for its organisation skills and defensive nous, it was as impressive in its way as Holland’s 5-1 demolition of Spain a week ago. Switzerland approaching respectability as Xhaka volleys in a superb effort past Hugo Lloris. Consolation for Switzerland as Blerim Džemaili fires in a free-kick from long range. Officially a rout. Another great free flowing move from the French and the finish is sublime from Moussa Sissoko – he passes the ball diagonally into the corner of the net – but again, one must ask, where was the defence? Paul Pogba, who has just come on as a substitute, curls an inviting ball with the outside of his right boot into the path of Benzema who turns and volleys through the legs of Benaglio. Olivier Groud’s opening goal tonight was the 100th France have scored at the World Cup finals. Switzerland are shellshocked after encountering a rampant France side in Salvador. 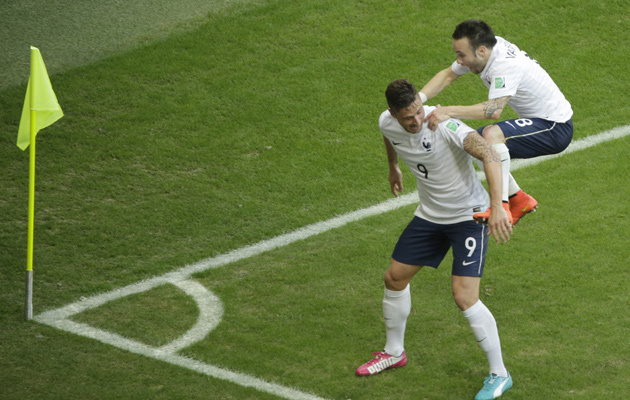 Valbuena celebrates with Giroud after scoring France’s third goal. Are France this good or are Switzerland that bad? It looks a bit of both. France break swiftly from a Swiss corner and Giroud finds himself in acres of space on the left wing – where is the defence? – and squares for Mathieuu Valbuena to fire home from close range. Karim Benzema’s spot kick is well saved by Benaglio but the rebound falls to Yohann Cabaye who hits the bar with the follow-up. That’s a terrible miss by Cabaye and a huge lleft off for Switzerland there. Karim Benzema brought down by Johan Djourou and it’s a penalty to France. Velon Behrami gives away possession straight from the kick-off. France burst forward and Karim Benzema finds Blaise Matuidi, who beats Benaglio at the near post. Two goals in the space of 13 seconds. Incredible! 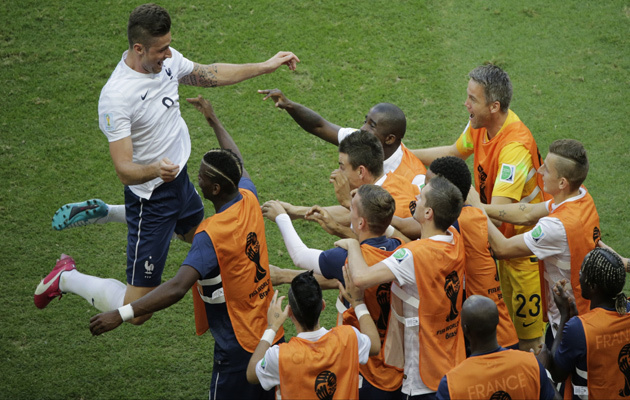 Olivier Giroud celebrates France first goal. Olivier Giroud claims well and heads home form a corner. Kick off time is approaching in Salvador and the teams are in. Didier Deschamps makes two changes to his starting XI. Juventus midfielder Paul Pogba is rested, as is Real Sociedad’s Antoine Griezmann. In their place, Arsenal striker Olivier Giroud starts as does Newcastle United midfielder Moussa Sissoko. For Switzerland, both goalscorers from their opening game against Ecuador, Admir Mehmedi and Haris Seferovic, who came on as substitutes in that match, start tonight. Switzerland: Benaglio, Lichtsteiner, Von Bergen, Inler (c), Seferovic, Xhaka, Behrami, Rodriguez, Mehmedi, Djourou, Shaqiri. France: Lloris (c), Debuchy, Evra, Varane, Sakho, Cabaye, Valbuena, Giroud, Benzema, Matuidi, Sissoko. An amazing scoreline, and one that Costa Rica thoroughly deserved. They top the group and become the first team from Group D to qualify – something they have achieved with a day to spare! The result means that England are out and one of either Italy or Uruguay will join them on the early flight home from Brazil. Italy are huffing and puffing but they haven’t come close to knocking the Costa Rica house down. It’s all been very predictable from Cesare Prandelli’s side. Even the normally imperious Pirlo has given the ball away with alarming regularity in what has been a very flat overall performance. It’s a terrible scoreline for England, who will be out unless Costa Rica lose today. It’s not exactly a great result for Italy either. If the score remains the same they will now need something from their final game against Uruguay to be sure of progressing. Costa Rica currently top the group. Who foresaw that this time last week? Costa Rica get their just desserts. Moments after the penalty controversy, they go ahead. It’s a great cross from Junior Diaz, leaving Bryan Ruiz to head home off the underside of the bar. 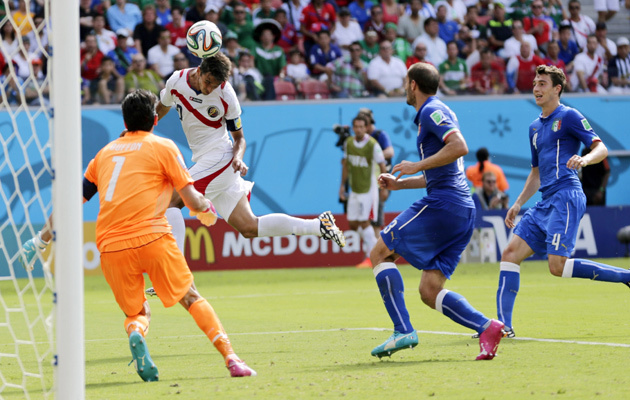 Costa Rica are convinced they should have been awarded a penalty. Indeed, everyone in the ground with exception of referee thinks they should have been awarded one. Joel Campbell bursts into the penalty area and is brought down by Giorgio Chiellini, but the referee waves play on. No kiss from the Queen yet for Mario Balotelli. Italy have made a tentative start to this game and then, on the half hour mark, Balotelli is put through by Andrea Pirlo, but the Milan striker badly miscues with just the goalkeeper to beat. The fans at the World Cup are worthy of a gallery of their own, so we have created one for you, featuring assorted oddballs and colourful characters, without whom the party would just not be the same. Italy make three change from the side that beat England last Saturday. Goalkeeper Gianluigi Buffon is fit to return and replaces Salvatore Sirigu, while Ignazio Abate comes in for Gabriel Paletta and Thiago Motta is in for Marco Verratti. 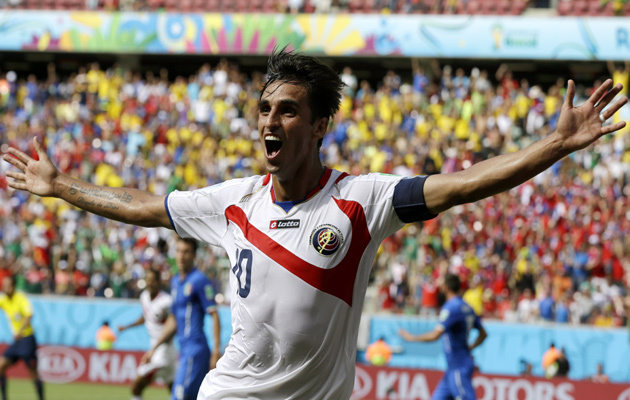 Costa Rica: Navas; Umana, Duarte, Gonzalez, Gamboa, Diaz; Borges, Bolanos, Tejeda; Ruiz; Campbell. Italy: Buffon, Abate, Barzagli, Darmian, Chiellini, De Rossi, Pirlo, Motta, Marchisio, Candreva, Balotelli. What would happen if you crossed Mario Balotelli with the Queen? Given the size of their respective populations, Uruguay are entitled to gloat after their 2-1 victory over England. But, the desire to portray last night’s win as some kind of redemptive moment for Luis Suarez, is surely taking partisanship a step too far. Some more amazing photographs from Brazil. 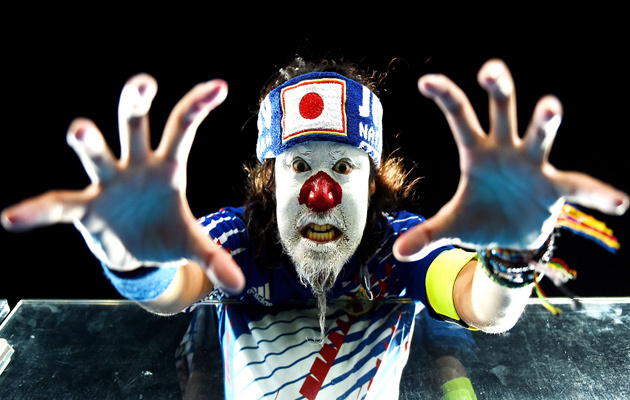 Check out today’s gallery, which includes this slightly sinister image of a Japan fan, taken ahead of their goalless draw with Greece. He certainly showed more animation than most of the players. Witness the contrasting scenes in Montevideo, capital of Uruguay, and Rio, where England fans had gathered on the beach to watch the match. It’s traditional in the wake of an England World Cup debacle for there to be calls for the manager to be replaced. Roy Hodgson, who has a contract with England until 2016, says he has no intention of standing down. Three more matches today plus reaction from yesterday’s games, in particular Uruguay’s 2-1 victory over England which left Roy Hodgson’s side’s hopes of progressing, hanging by a thread. In the late game of the day we saw a contender for the worst match of the tournament as Greece and Japan ground out a tepid 0-0 draw. Later today Italy face Costa Rica, France play Switzerland, while Honduras meet Ecuador.